There is no doubt that the consumer journey is still evolving as people adapt to ever changing technologies, and the corresponding information sources that are enabled. “The average number of information sources used by shoppers doubled from 2010 to 2011”, Professor David Bell. The new approach to a decision journey below attempts to highlight the complex and non-linear paths that people can take when discovering and purchasing products or services. Important to note when interpreting it is that a person can start at any touchpoint, except for ‘your business’, and move on to any subsequent touchpoint. A friend may tell you about a product (word of mouth), moving you from awareness to consideration to evaluation in the space of a conversation. However, you may then determine that you do not need the product at that particular time, and go back into the awareness orbit until you are ready to reconsider. These channels are the predominant forces in the awareness orbit, and is where consumers are first introduced to brands and their respective products and services. These sit on the fence between awareness and consideration as they can both generate awareness through paid initiatives (e.g. sponsored posts), and spark consideration if you see that your friend has liked it. The arrows indicate movement in all directions. You could see an ad or post on LinkedIn and then go to Facebook to see if your friends like it, and so on. Here we validate and rationalise. Again, movement is possible in every direction. We could search for competitors, check with some friends or consult with our networks – and in any order. Word of mouth is meant in the traditional sense, such as asking a friend or hearing about a brand from colleagues at the water-cooler. I would argue that word of mouth via social channels sits more naturally under consideration than under evaluation. For one, I would attribute more weighting to a recommendation from a friend telling me in person than a retweet or ‘share’, which they may have simply done to get a free coffee at Starbucks. And we all know that bloggers get free stuff. In line with Procter & Gamble’s original thinking back in 2004, research from McKinsey (2009) shows that the in-store experience is still crucially important – up to 40% of consumers abandon their purchase intent as a result of something they’ve seen, learned or done in the store. Packaging, product dimensions, signage, interactions with sales people and the shelf position can all impact those critical last few steps of the journey. Similarly, with e-commerce poor UX or a non-responsive web design can lead to shopping cart abandonment and high bounce rates. As mentioned above, multiple paths are possible. Consumers can of course go straight from seeing an ad on TV to purchase. They could also see the ad, then check YouTube, read some reviews and then go back to Facebook to find out more. The potential paths are countless. A prospect may be all the way in the evaluation phase, may have seen ads, may have consulted friends, read countless reviews but then decides that they will book that holiday next year when they have saved up. An acronym to be aware of is ROPO which stands for research online, purchase offline. According to a recent global study by DigitasLBi 88% of consumers research online before purchasing in-store. This trend needs to be anticipated and accounted for. As a quote from Vincent Druguet in the study explains aptly “Shoppers worldwide now regularly use digital devices before shopping in store. They need triggers to get them into the physical retail environment where mobile and social media are game changers. Retailers need to adapt to offer consumers in-store experiences as exciting, as useful and as personal as the online shopping experience, combining all of the purchase touch points to build a relevant consumer journey for people to get whatever they want from wherever they are”. ROPO is also referred to as reverse-showrooming or webrooming, and a recent report by BI Intelligence shows that this may be more popular than showrooming. Under the showrooming approach consumers look at a product in-store and then search the internet for the best deal. Both showrooming and reverse-showrooming fall under ‘search’ in the evaluation phase, and understanding how these approaches are prevalent in your customers’ journey can help you accommodate for them. An example of a possible strategic response to showrooming was employed by the British DIY retailer B&Q who developed an app that offers customers in-store deals. Customers can scan items on a shelf and get immediate bespoke offers based on their loyalty card status. Although this tactic can perhaps curtail showrooming I do not profess to know that it was the key objective of the scheme. Of course the journey continues post-purchase – people can ‘share’ their purchase on social networks, write a blog or go to Facebook and Twitter to complain. It’s two-way communication and here too the possible paths are numerous. For the people that don’t ‘share’ their purchase companies could see this as an opportunity to follow up with support or a survey, to understand if there is part of the purchase experience that can be improved. The most prolific models to date are the purchasing funnel, McKinsey’s Consumer Decision Journey and Google’s Zero Moment of Truth (ZMOT). All three are excellent models, striving to explain how consumers make purchasing decisions. And although the methods and touchpoints are becoming more sophisticated, the initial stages of the good old original purchase funnel – awareness, consideration and purchase – are still inherently the same. For the key takeaways on ZMOT I recommend Danyl’s piece. • Consider how you can earn attention at every step of the customer’s journey and especially when they’re on your site. For Brian Solis’ take and contribution to ZMOT, his article on The Ultimate Moment of Truth and The Art of Digital Engagement is also a good read. Seychelle Media also take a more digital look at attracting prospects all the way through to conversion. 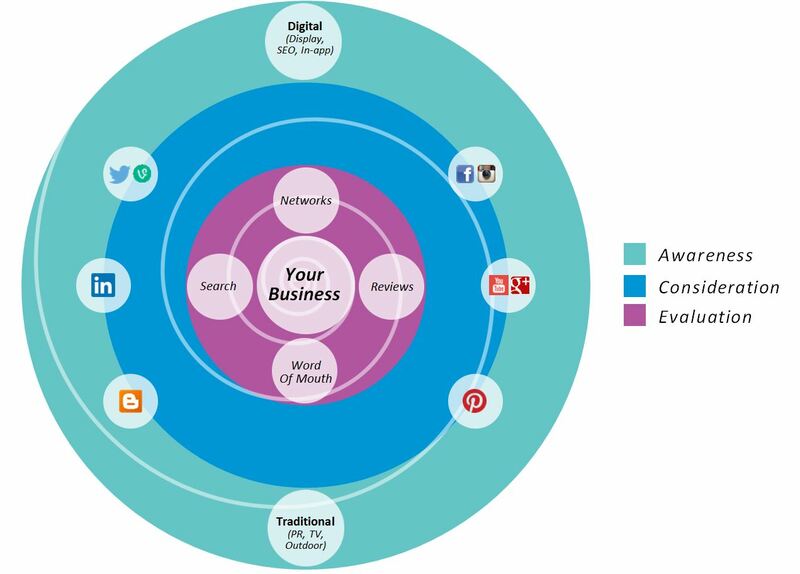 It provides a short overview on digital tactics that can be employed to drive engagement, conversion and inspiration. Whichever model you utilise to determine your strategy, remember to establish the overall business objectives first, then listen and learn from your customers – which touchpoints work best for them? On which channels are they found? What content do they engage with? What do they want? Are your customers searching for you (need), or discovering you (want)? Also consider your competitors. The power of digital touchpoints is that you can experiment and optimise continuously to improve and perfect each interaction. Ultimately providing the right message in the right place at the right time. Every sale turns a customer into either a buyer or an influencer. If you aim and work on the latter you can win life-long customers and gain invaluable word of mouth marketing. McKinsey calls what I call influencers ‘loyalists’, and splits these into two further groups. The passive loyalists and the active loyalists. The key out-take from this insight is that passive loyalists tend to be open to messages from competitors, and that identifying and accommodating for them can attempt to counter this. There is not a consumer journey, there are millions of possible journeys. The more I read these articles, the more I realize that how little I know about this, even though I am majoring in marketing. The illustration is remarkable! I am holding on to this one for a long time. Splendid work! Social media does play an important role! Even from a personal point of view, I cab say that many things I end up buying are from an ad I saw on the social media platforms like Facebook or instagram. Very interesting information and statistics. A bit confusing, but I’m going to browse another article to find out if there are some actionable steps I can take. I’m sure this is just an overview. I would love to learn how to capture my customer’s attention at every turn! Thank you.